Whether you've never been on a horse before or you've done some riding, we have great instructors and equally great horses and ponies that can help you reach your goals! 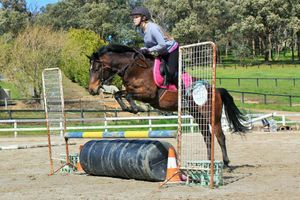 We have a number of options for group lessons where we aim to group students according to their riding level. Enrolments are purchased in a block of sequential weeks (aligned to school terms) and students attend their scheduled lesson each week. All our group lessons offer students the opportunity to look after a horse as if it were their own for the duration of the class and participate in our structured learning program, ultimately giving students the information they require if they were to be responsible for a horse from a basic to more advanced level. Group classes are held on Saturdays and after school. Students are encouraged to attend for 2 hours, of which approximately 1 hour is dedicated to riding. The remainder of time is spent grooming, saddling and participating in horse handling and theory exercises. Each student is enrolled into a specific day and class time, allocated as appropriate for the student's level. We may need to shift students occasionally during the term or for the next term, to maintain small class sizes as well as a challenging but safe learning environment. The Sunday program is a fortnightly day program running from 10am - 4pm. Students are allocated a horse for the day which they are expected to look after including feeding, grooming, saddling, and turning out at the end of the day. There are two riding classes (morning and afternoon). We provide a BBQ lunch for all students and horse handling and theory exercises similar to that of the shorter group classes. Our Term Programs and fees are based on Term Enrolments where students come to their scheduled class each week for the duration of the term. We offer a substantial discount to students who buy a Term Enrollment as it gives us the certainty we need for adequately planning human and equine workloads and class schedules. Enrolled students are streets ahead from a cost perspective even if they miss a couple of lessons due to other priorities (eg. parties, holidays, school events) AND you can rest assured we uphold our commitment by ensuring we always have a pony available for you in your scheduled class. Additionally, for Saturday and midweek students, your enrolment fee covers your hour of riding. 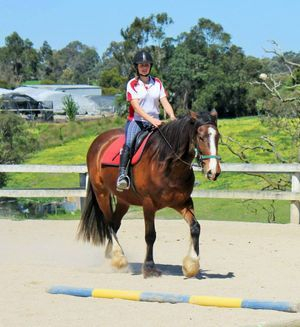 The additional time spent here learning all-round horsemanship is complimentary as we strongly believe in providing a comprehensive education. Therefore if you're not able to attend the full 2 hours each week, you might miss out on a bit of learning and practice, but you're still getting what you pay for! A private lesson can be tailored so you get exactly what you want out of a lesson. And if you don't know what you want, our instructors will always have suggestions! We offer private lessons during the week only and they can be booked on a regular or casual basis, subject to availability. Check out our Booking & Payment Policy for more information about enrolments. If you're happy to proceed, send us an email with a bit of background on your riding experience, your approximate age, height, weight and your availability. We'll get back to you with some options, or add you to the waiting list for a suitable opening. "Professionally run facility with quality horses and instruction. 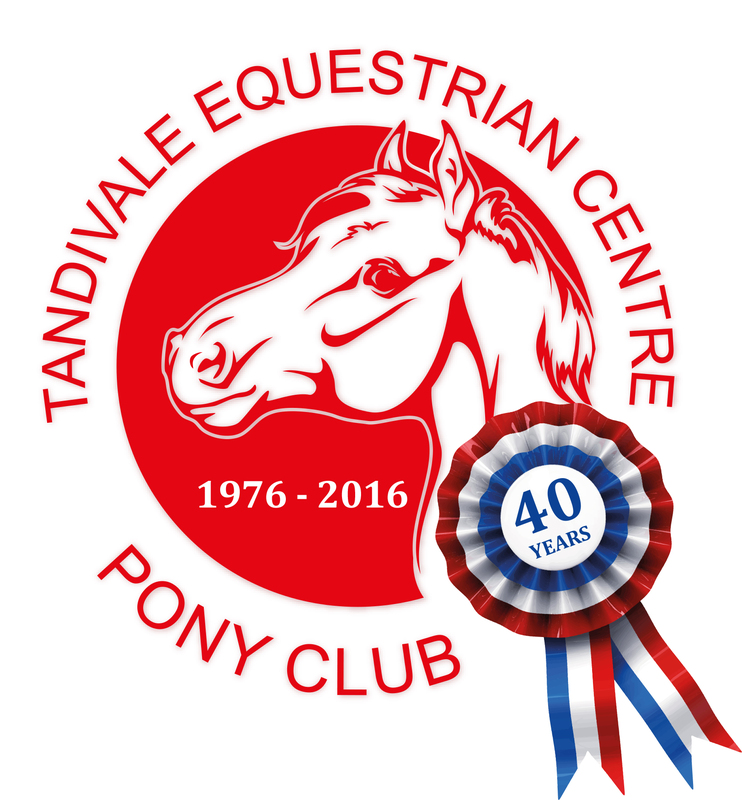 If you are looking for somewhere to get a friendly, knowledgable and comprehensive education about riding, horse..."
"I've been at tandivale for a year now and i love it, everyone is so nice, the best ponies and amazing instructors! "I just wanted to say a huge Thank you for all that you and the girls that looked after us on the day, did to make Marina?s birthday a very special occasion indeed! It was an ama..."